Kyle’s life begins to unravel when a terrible fire consumes his aunt’s orchid estate on Maui destroying their livelihood, and killing his only living relative. He moves to Tempe, Arizona, bringing the only orchid to survive the fire—the Dracula vampira. Finding solace in the gay community of Ixtlan, Kyle begins to heal from his troubled past, but even his new identity as Tom Tanner cannot protect him from his tragic fate. – David Leon Higdon, Ph.D., Paul Whitefield Horn Professor of English (Texas Tech University) and Honors Professor of English, (University of New Mexico). 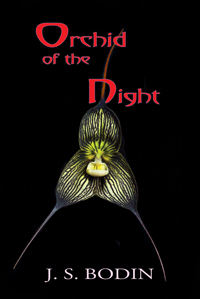 Read Joanne’s Interview about Orchid of the Night on the SouthWest Writers website. Joanne discusses the background for the novel, which is inspired by true events. She also discusses research into the Gay Liberation Movement and how that influenced her choice to use the gay sanctuary called Ixtlan. She also talks about her love of the written word and how poetry has been the mainstay of her writing career.